Big, brawny and beautiful are not words that would often be put together to describe something. Unless it is the INFINITI QX80. The luxurious SUV from INFINITI has been raking in rave reviews from all quarters ever since its launch. In a market like the Middle East where SUVs have a sizeable share, the choices are numerous. Standing out from the crowd is no easy feat and the INFINITI QX80 has managed to achieve a distinctive status. The spacious and luxuriously fitted out QX80 has a number of features that make it stand out from the rest. While the spaciousness itself is one of its highlights, the SUV has undergone a redesign in various aspects giving it a more taut and muscular edge. Powerful Elegance is the new design language of the brand and the QX80 is a fine example of this philosophy. At first glance, the QX80 appears more chiselled with a few redesigned elements that only complement the sheer size of the vehicle. Let’s get one thing straight – the QX80 is a big vehicle and the design elements in no way take away from the largeness of it. There is a certain sleekness to the brawniness of the QX80 which has been achieved through some smart designing. For instance, the new headlights have gone a couple of centimetres up in positioning while it has been given a slight makeover for a more refined shape. The flared bumpers and air intakes are redefined to give the QX80 a more stylish yet powerful stance. The rear LED taillights have been redone as well, a clear nod to the new design philosophy. Stepping into the QX80 is liking entering your personal citadel on wheels. As mentioned earlier, spaciousness is one of the main elements of the QX80 and clearly one of the appealing factors of the SUV. People love their large vehicles here. Add comfort to that and you have a clear winner. So can 8 adults sit comfortably in the QX80? They sure can. The roominess in the SUV is not limited to the front seats and second row. The third row of passengers can also sit comfortably without feeling cramped. 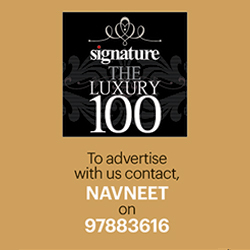 The cabin is plush and exudes a certain classy vibe that reiterates the brand’s design philosophy. Much of the interiors is a fine blend of leather and wood, which gives the QX80 a richer feel. The centre console packs in all that one would expect to see in a luxury SUV, and then some more. The touch screen and control panel take a bit of time getting used to but once you get a hang of it, the ride becomes smoother. Once we got past the design elements and roominess of the QX80, the feature that had us discussing in length was the Smart Rear View Mirror. The rear-view mirror transforms into live camera mode at the flick of a switch. The real time view is clearer, safer and is perfect even in dimly lit spaces when reversing. It takes a tad bit of time getting used but after the initial few moments, you do wish for more manufacturers to install this feature in the upcoming models. We have been told not to judge a book by its but when you look at the QX80, you cannot expect anything but the SUV to switch to beast mode when on road. And the luxury SUV surely does not disappoint. The QX80 is powered by a 5.6-litre naturally-aspirated V8 engine that produces 400 hp (298 kW). The seven-speed automatic transmission, a standard in every model, is responsive and switches smoothly between gears. Driving the QX80 is almost effortless. The vehicle moves with such dexterity that you often tend to forget the sheer size and power of the vehicle. Infiniti has softened the dampers at each corner by 30 percent, which boosts the ride comfort factor. Take it off gravel or a bumpy stretch and the QX80 performs like a dream. Be it on the busy city streets or rougher terrains, the QX80 is at ease making the experience smoother for both the driver and occupants. INFINITI has always strived to stay at the top when it comes to safety features. Some of the technologies included in the Qx80 are Lane Departure Warning and Prevention, Intelligent Cruise Control, Distance Control Assist, Predictive Forward Collision Warning, Forward Emergency Braking, Blind Spot Warning and Intervention, and Backup Collision Intervention. 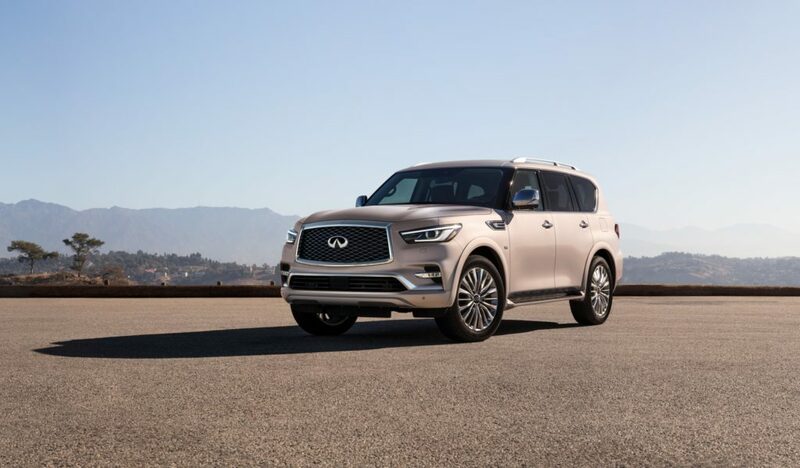 Luxurious, elegant and powerful, the INFINITI QX80 is a fine example of automobile engineering and a star performer from the premium Japanese auto manufacturer.